This past weekend Mary and I took a ride up to Killington, Vermont. We heard there was something going on with the leaves up there. Fall foliage viewing is one of the most underrated fall sports. Well, actually, it's not truly a sport unless you add something to it like hiking, horse back riding, or mountain biking, then it becomes a more active thing. Although, there are some folks that treat this passive act like a full contact sport. There isn't anything scarier than walking along a pretty country road and seeing a 1974 Mercury headed toward you and all you can see behind the wheel are white knuckles and blue hair. In that instant you will become a leaf-peepin' marathoner. Yes, I, too, like to drive all over heck and stare off at "the colors, man", but I also like to get out and feel the fall as well. This weekend we felt the fall. Saturday was sunny and bright, just perfect for doing autumn stuff like looking at leaves, stopping by farm stands, drinking hot mulled cider, and eating maple flavored things. When the sun hits your face through the cool fall air under puffy clouds hanging in a very blue sky it is like the last birthday present in the pile--it's always the best, and one you savor most till next year. The photo above was taken on that day in Woodstock. It was a great day. 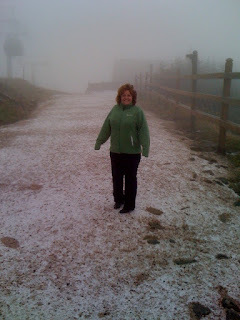 On Sunday it was in the low 30's at the base of Killington Mountain a mile or so from our hotel. We froze our summer skin right off that morning. That dose of Fahrenheit was numbing, but at the end of the day, it was appreciated. We ascended the 6200 feet up the now cloud shrouded mountain in a gondola, and slowly the land pulled away from us in the distance. The clouds began to settle around our enclosed ship, and in a few minutes we were at the top of the mountain. The only way we actually knew that we had arrived was because the doors opened and the gondola slowed down. We had been transported directly into winter. That autumn scene above normally takes two months to become December. This time it took just 24 hours. We went inside of the summit building and bought a couple of hot drinks at the restaurant, found an empty table by the large floor to ceiling windows, and stared off into the clouds only eight feet from our faces. The view was so, so...,well, white. Just white. No color. Just white. 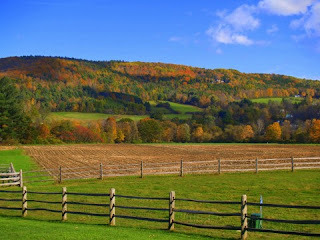 Very soon, maybe within a week, those peak fall colors we enjoyed in Vermont will be in our backyard here in Sturbridge. Every day they are a-changing more and more. Feel the fall sun on your face. Take a walk around Westville Lake, or around the Heins Parcel on Leadmine Road this weekend. Savor the Autumn now, because December will be here tomorrow. Photo above: Snow making at Killington Resort, VT on October 13, 2009.